Mural Routes created three new murals in Toronto’s Birch Cliff community, as part of the Birch Cliff Community Mural Project. 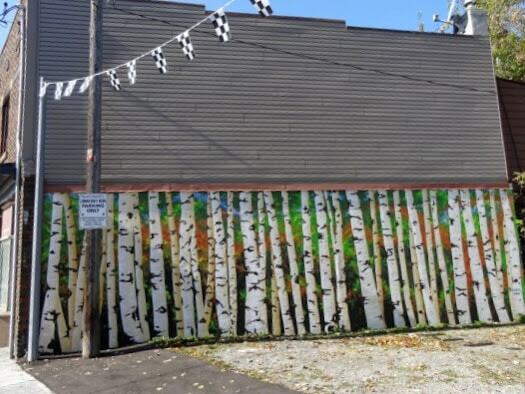 The partnership project now totals six unique birch tree themed murals along Kingston Rd from Warden Avenue to Birchmount Road. “Welcome to Birch Cliff” was designed by Anthony Delacruz and painted by Mural Routes artists and volunteers. By engaging with Mural Routes, the Birch Cliff Residents’ Mural Committee hoped to reduce the impact of tagging and encourage businesses to take pride in their buildings and become part of a street improvement program. We proposed to use the theme of re-foresting Birch Cliff with the theme of birch trees; to have a series of murals, some painted, big and small, some installed on panels, in keeping with the scale of the main street facades. Mural Routes gratefully acknowledges that “Forest of Birch Trees”, “Welcome to Birch Cliff” and “Birch Cliff Bell Box” were made possible through funding by StreetARToronto, employment grants from Ministry of Culture, Tropicana Community Services and TDSB Focus on Youth, as well as community fundraising. Support for the “Forest of Birch Trees” mural was also provided by the Birch Cliff Home and School Association and the TDSB.